Osteoarthritis is a very common joint disease that affects roughly one in ten Canadians. People who suffer from it live with chronic pain and over time the disease may restrict their movement. Fortunately, this disease progresses slowly over many years, so there is time to manage the symptoms and figure out how to cope with them. 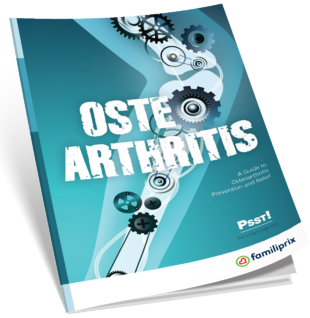 This guide was designed to help you understand osteoarthritis and learn how to live with it. What joints does it affect? What are the warning signs and how does 8the disease evolve over time? What can I do to ease the pain 9and manage osteoarthritis? The key to success is what you eat! Aids to improve your daily life!